Although the FOMC minutes revealed that some policymakers expressed concerns about raising interest rates too early, the Greenback still managed to advance against the Loonie, probably because the U.S. economy is on much better footing compared to Canada. After all, the Fed isn’t really looking to cut interest rates anytime soon while the BOC might lower interest rates once more if economic data continues to disappoint. I was able to go long around 1.2450 and set my stop at the 1.2300 handle, just below the bottom of the descending triangle. I’ll be aiming for the 1.2600 major psychological resistance near the top of the triangle. I’ll also watch out for Canada’s retail sales release on Friday, as stronger than expected data might still lead to a Loonie rally and a downside break. In that case, I’ll try to exit my trade early before price hits my stop. 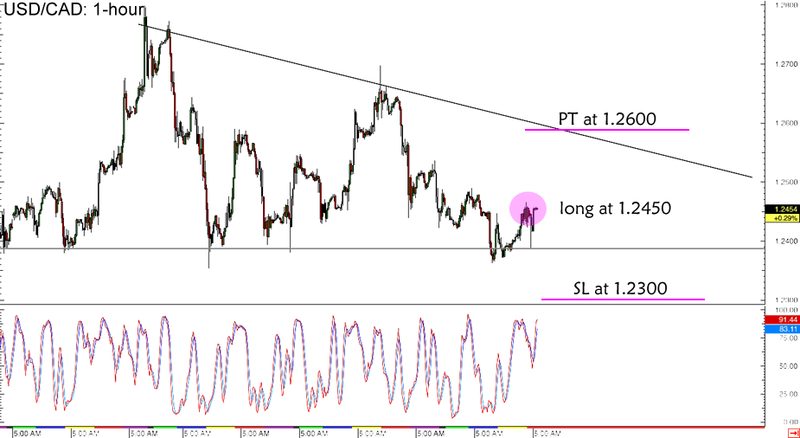 Long USD/CAD at 1.2450, stop loss at 1.2300, profit target at 1.2600. I’ll be risking 1% of my account on this short-term setup so make sure you read our risk disclosure if you’re planning on joining me. What do you think of this forex play?